You know your wife needs your prayer support in dealing with the stresses of life, the temptation of the world, and the attack of the Devil. We know we should be praying for our wives, but how? How many times have you sat in church or gone to a men’s meeting and made a commitment to pray for your wife? You raised your hand or signed a card, but it seemed within just a few days you had failed. 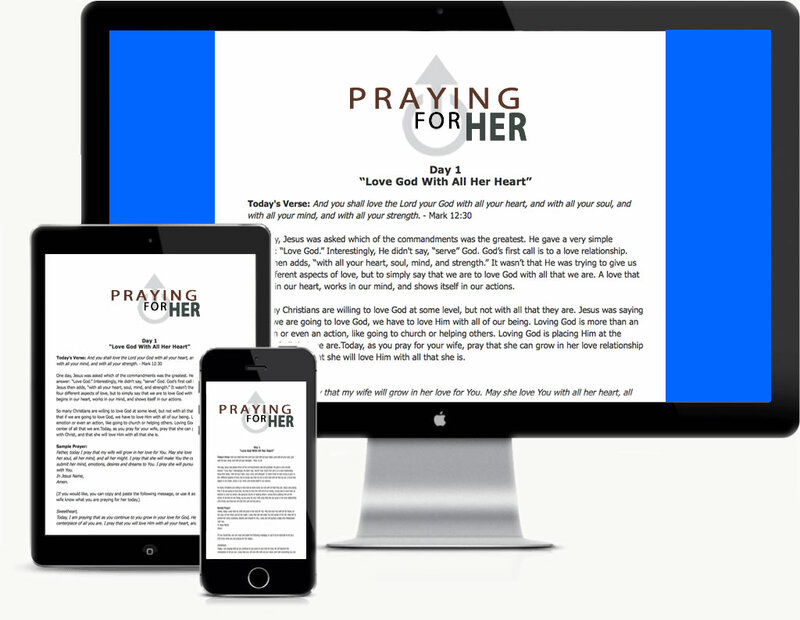 This could be the beginning of an incredible new habit of praying for your wife every day. If you have difficulty subscribing, or have additional questions, feel free to contact me at billy@nationalprayerroom.com, I am happy to help in any way we can. If you didn’t have to tell him, what do you wish your husband was praying for you about? We took those answers and incorporated them into the topics in Praying For Her. My wife and I were on the edge of divorce and struggling tremendously in our relationship. This program really helped me to learn to love her more and be faithful in prayer for her. Thank you. I have a hard time expressing myself through prayer. I tend to repeat the same words over and over. Praying for her has help me overcome this. I also loved being able to send my wife a short text telling her what I was praying for her about. My wife and I have been going through some very difficult times in our marriage. Praying for her has been one of the biggest blessing to restoring our marriage. I thank God for showing me this resource. I plan on continuing to pray for my wife everyday even after the second 31 days is over. Thank you so much and God bless you. One day, Jesus was asked which of the commandments was the greatest. He gave a very simple answer: “Love God.” Interestingly, He didn’t say, “serve” God. God’s first call is to a love relationship. Jesus then adds, “with all your heart, soul, mind, and strength.” It wasn’t that He was trying to give us four different aspects of love, but to simply say that we are to love God with all that we are. A love that begins in our heart, works in our mind, and shows itself in our actions. Today, as you pray for your wife, pray that she can grow in her love relationship with Christ, and that she will love Him with all that she is. Father, today I pray that my wife will grow in her love for You. May she love You with all her heart, all her soul, all her mind, and all her might. I pray that she will make You the center of her life. Help her to submit her mind, emotions, desires and dreams to You. I pray she will pursue a deep love relationship with You.